An article by Matt Muchowski that is part of an ongoing debate on the use of labor contracts. I wrote a piece in the December 2013 Industrial Worker (IW), “The Contract As A Tactic,” which appeared on page 4, discussing the IWW’s relationship with contracts, and I encouraged the union to see them as a tactic that can be used when it makes sense. I’m glad to see that it has sparked some conversation, with separate response pieces printed in the January/February and March 2014 issues of the IW. I wanted to write another piece to keep this conversation going, and perhaps clarify my views on the topic. Overall, the decision about which tactics and strategies to use is up to each workplace, and I’m glad that our union is big enough to support workers with different views on strategy and tactics . 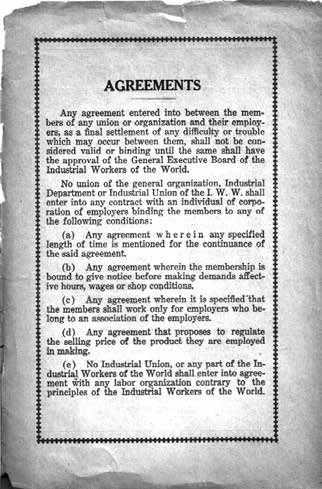 I agree with Fellow Worker (FW) Juan Conatz, who wrote in “Contractualism Should Be Avoided” (January/February IW, page 4), that organization is the base of the IWW’s strength, but at times a contract can be used to organize—whether it be offensively to mobilize workers around their demands, or defensively as a shield to keep union supporters employed when the boss tries to fire them. We should not make our strategies or goals revolve around a tactic—whether it be contracts, strikes, or picketing. Using any given tactic does not prevent us from using other tactics either at the same time, or at a different time. “Contractualism” is something that should be avoided just as much as “‘strikeism,” “electoral politics-ism,” “OSHAism,” or “picket-ism.” Turning any tactic or tool into an ideology or strategy leads us to build towards an action or event, with no follow-through. Our goal is have workers democratically control the means of production, and it’s not my intent to compare “contractualism” to “all-out-revolution;” rather it is my intent to encourage any and all tactics necessary to build our union so that we have the strength to follow through on our “unfinished business” as former IWW General Secretary-Treasurer (GST) Fred Thompson put it. FW Conatz makes the point that if a shop were strongly organized enough to get a contract without certain promanagement clauses, we could be strong enough to simply impose the will of the workers without a contract. I feel like this is a slippery slope argument—if we are strong enough to do X, we are strong enough to do Y and Z. The fact is that workers’ organization isn’t always strong enough to get X, Y and Z, but if they can get X and Y, why shouldn’t they take it, and use those extra resources to fight for Z as well? The reality is that workers in each shop and throughout the IWW and the labor movement have to assess their strengths at the moment and make decisions that will allow them to build off of that strength. Having an “all or nothing” approach will hurt our ability to get it all. In his article “Contracts Are Not A Tool, They’re A Trap,” which appeared on page 11 of the March IW, FW Scott Nappalos described a bad experience with contracts at his branch’s shop—where workers became apathetic because, despite having a contract, there was a lack of organizing. Unfortunately, sometimes the union loses battles. Workers are fired and unable to get their jobs back, strikes end with the workers returning to work to keep their jobs without obtaining the goals they set out on strike for, and occupied factories can be evicted by force. In FW Nappalos’s example, a contract was an end in itself and wasn’t used to organize and mobilize workers. The fact that these tactics sometimes fail to achieve the union’s goals is not a reason for us to swear to never use them under any circumstance. Rather, it’s a reason for us to examine the particulars of why that tactic in that circumstance didn’t lead us to our goal of better and stronger organization of the working class, and what we can change about it in the future. In some ways, FW Nappalos’s article actually supports my point. The contracts gave the union a foothold in the shops, and when effort was applied, the union was able to organize in these shops. No matter what tactic is used in organizing, effort is necessary to make it successful. Some “tactics” are always bad, as they do not even try to lead us to our goal—any tactic that undermines union democracy or pits workers against each other for example. However, tactics that are used to advance us towards our goal, even if they might not succeed, are up to workers to decide on a shop-by-shop and industry- by-industry basis, and eventually as a whole social class. Granted we need some standards to make sure that a particular shop doesn’t do something which is inconsistent with the values and goal of our union. Some of these are hard-line standards, some are “best practice” standards, and some will be left up to shops to decide on a case-bycase basis. Historically our union set standards for contracts by requiring that they be approved by the General Executive Board, and that they be consistent with the values of the union. The IWW has also rejected contracts that had “specified lengths of time” or required workers to state their demands before taking action on them. You can read more about these standards in a pamphlet that the union put out in the 1920s that examined how the union can organize around bread and butter issues’ in a revolutionary way called “The Immediate Demands of the IWW,” at: http://www. workerseducation.org/crutch/pamphlets/ immediate.html. FW Nappalos said that we shouldn’t expect our opponents to play fair, and that they often use legalistic framework to keep us from organizing. Our opponents won’t play fair, and they will use any means and any tactic to keep us from organizing—not just legalistic ones. With that said, we don’t have to “play fair” either. We’re not required to tell the boss our strategy, tactics or intentions—in fact sometimes it may be useful to mislead the boss. We can talk to them about contracts while we are organizing direct actions. We can make the boss think that we are conceding something big, when we didn’t have it to concede in the first place. The boss can feel free to mistake our tactics as reformist, and give in to some immediate demands of ours. However as a democratic union we are required to be honest with each other—that we will fight to end against the system of wage slavery, no matter what we take from the boss, or what they give to us in the meantime. I think it is important that the IWW fights to win in a big picture way. We need to win against capitalism. There will be ups and downs in that fight, day-to-day battles, as well as struggles that last months, years and decades. But just as the boss leaves every tactic on the table—including contracts that they don’t like, including legalizing strikes, including force, etc., we too need to leave every tactic on the table. Contracts, like any tactic—including strikes, if done in a reformist way—can be a trap for workers, but if done in a smart, revolutionary way, it can help set traps for the boss. I’ve commented on some of the related posts on Libcom, and fellow workers interested in the conversation can follow or contribute there in addition to the IW.